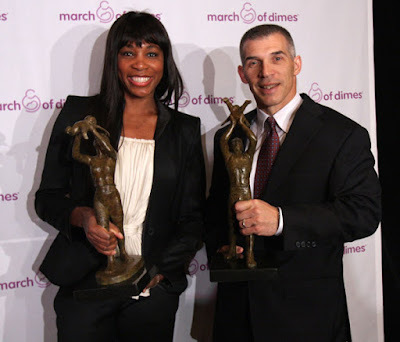 Sportswoman of the Year Venus Williams and Sportsman of the Year Joe Girardi attend the March of Dimes' Sportman and Sportswoman of the Year luncheon at The Waldorf-Astoria on December 2, 2009 in New York City. 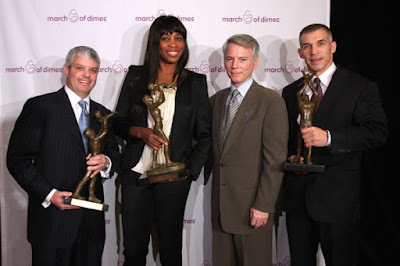 Venus Williams presents Kelly Bensimon and her daughter with the first ticket to the March 1, 2010 MSG hosted "BNP Paribas Showdown for the Billie Jean King Cup" at Madison Square Garden on December 2, 2009 in New York City. Serena and Venus Williams, Kim Clijsters and Svetlana Kuznetsova will play a one-night exhibition for the Billie Jean King Cup at Madison Square Garden in March.The March 1 event will feature one-set semifinals then a three-set final, all with no ad scoring. 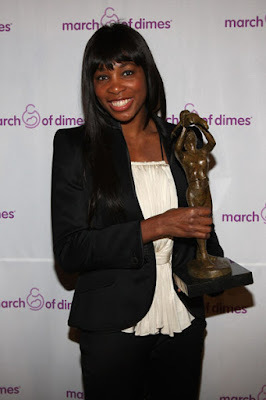 Serena Williams beat her sister in last year's final.